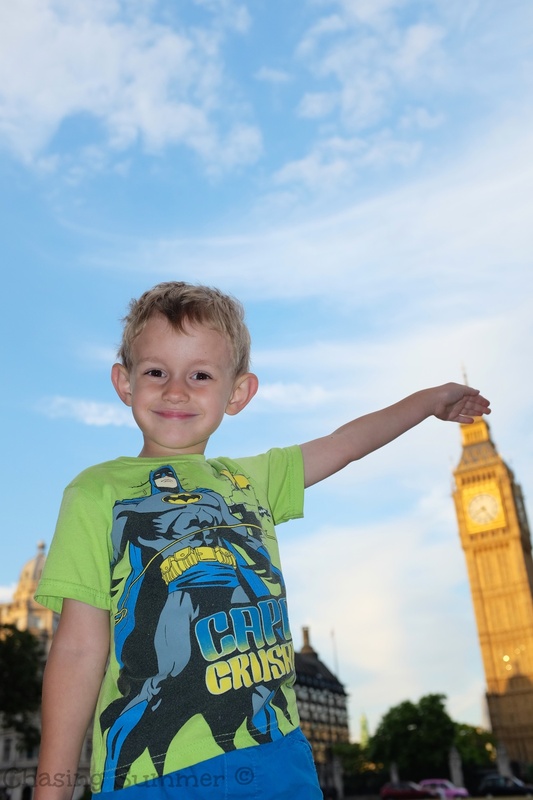 Here is a list of our 10 favorite activities to do in London with kids. All activities listed here are kid tested and approved, and best of all none of them will put a dent in your wallet. Trafalgar Square is a great place to walk around with kids. The giant lions are a fun attraction for any youngster brave enough to climb up and pose for a picture. Our two year old, who was not quite brave enough for a trip up the lions, preferred to play with the fountains. A fun, and unusual sight is the blue cockerel that stands high on a pillar in the middle of the square; it provides an odd contrast to the otherwise classic sculptures scattered around. While walking through Kensington Gardens, a sign for the Peter Pan Statue caught our eye. We decided to follow the sign, not knowing what it was for, and came across a fun statue with the inscription "Peter Pan, the boy who would not grow up." Both our children have always been fans of Peter Pan, and were happy to pose for pictures. There is also a little duck pond across from the statue, with signs describing the various birds you will find in the water. We did indeed see a lot of the birds, and the kids had fun spotting the different kinds. 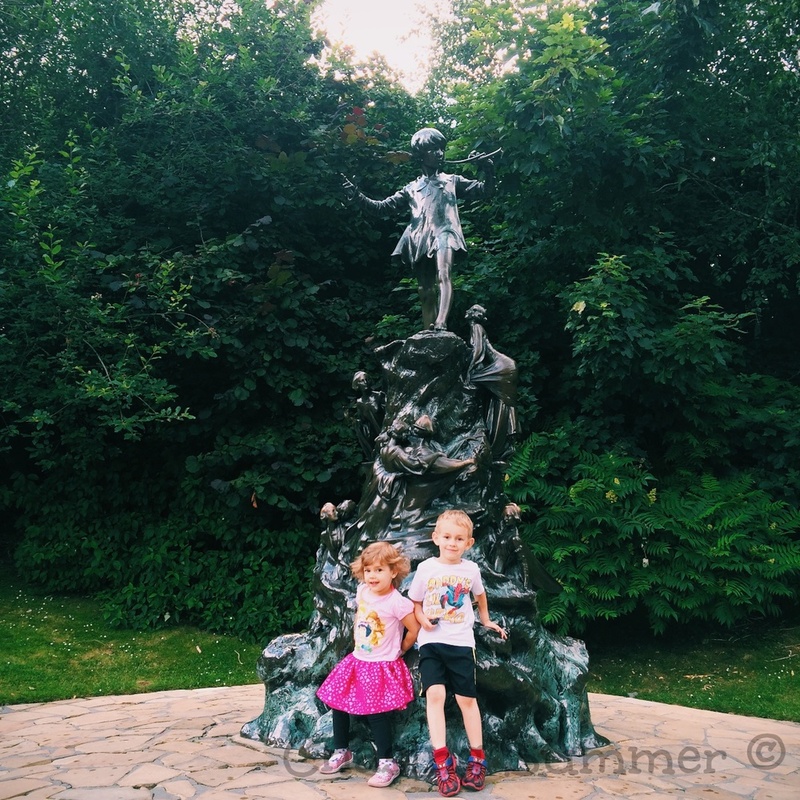 Read our blog post for more about Kensington Gardens and the Peter Pan statue. South Bank, located on the south bank of River Thames, is a very happening area, and the perfect place for a walk with your kids. In addition to housing the London Eye Ferris Wheel and having fantastic views of Big Ben and Parliament, you can also find some fun attractions for kids. Ours especially enjoyed the carousel, a sand box, multiple street performers, and of course, cotton candy. 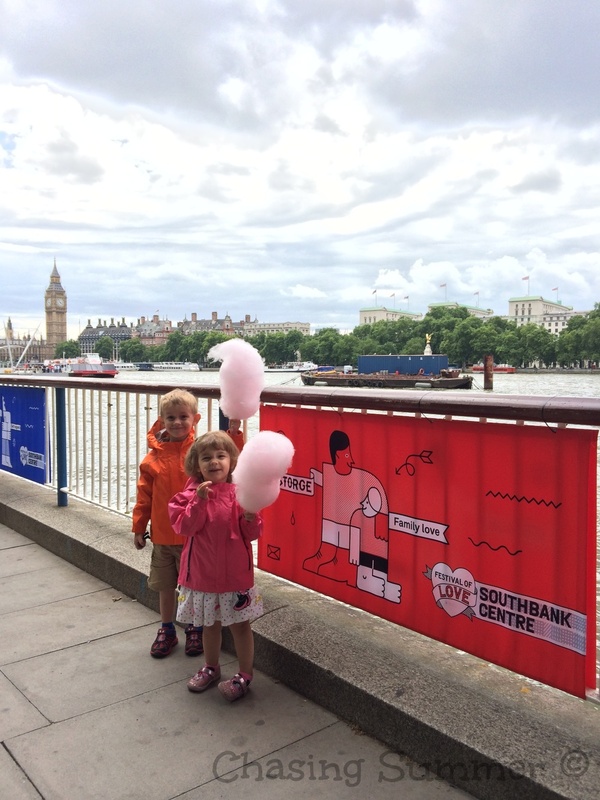 Read our blog post for more about South Bank. While there is nothing especially unique about the Waterside Gardens park, what made it special for us was the proximity to where we were staying. You don't always need to go to Hyde Park or Kensington Gardens just to have fun running around and playing tag. Enjoy any of the well maintained parks nearby where you are staying for a fun family experience. Read out blog post for more about our fun times in Waterside Gardens park. Our kids love taking pictures, and a great (albeit a bit slow) way to get them to walk long distances without complaining much is to let them take pictures as they walk. We have found these VTech cameras to be great for them. While the picture quality isn't great, they are easy to use and durable, which is more important for a 2 and 4 year old. Read our blog post for more about our little photographers' experiences with these cameras. When you encounter a rainy day in London, and there are no shortages of those, a free* way to have fun is a trip to Harrods. We managed to spend about 2 hours in Harrods without buying a single thing, which we consider quite an achievement! Our kids had a blast playing with all the toys in the various themed rooms. From legos and cars that drive on walls and ceilings to princess castles and baby dolls, there's enough variety to keep any kid entertained for a while on a rainy day. Read our blog post for more about our play time in Harrods. The subway system in London is for the most part very clean and safe for the family. We love the glass sliding doors which are on the platforms at many of the stations, it helps keep a parent at ease when the train starts approaching. It's also nice that most stations have countdown timers to the next train. With the deep, deep platforms, it's also a good thing most stations have escalators. These extra touches are what really makes the London metro system a much more kid friendly experience than NY. Travel Tip: Make sure you get a refund for any remaining money on your Oyster card before you leave London. Read more on our blog. Having stayed in Wapping, it was a short walk through Saint Katharine's Docks to the Tower Bridge. Even if you aren't staying anywhere in this area, it's worth a walk through Saint Katharine's Docks if you have the time. There is a lot of neat artwork on the walls, which our kids enjoyed looking at and taking pictures of. Once at Tower Bridge, it's a pleasant walk down and back, and you'll find yourself right next to Tower of London. Read our blog post for more about our walk around Saint Katharine's Docks and Tower Bridge. No trip to London is complete without a visit to the iconic Big Ben. As I mentioned before, both our kids love Peter Pan, and they had been excited for some time to see Big Ben. You'll also be right next to Westminster Abbey, and a short walk to South Bank and the London Eye Ferris Wheel. Read our blog post for more about our visit to Big Ben. Our absolute favorite family experience in London was the amazing (and free) Princess Diana Memorial Playground in Kensington Gardens. This playground is huge and immaculately maintained. 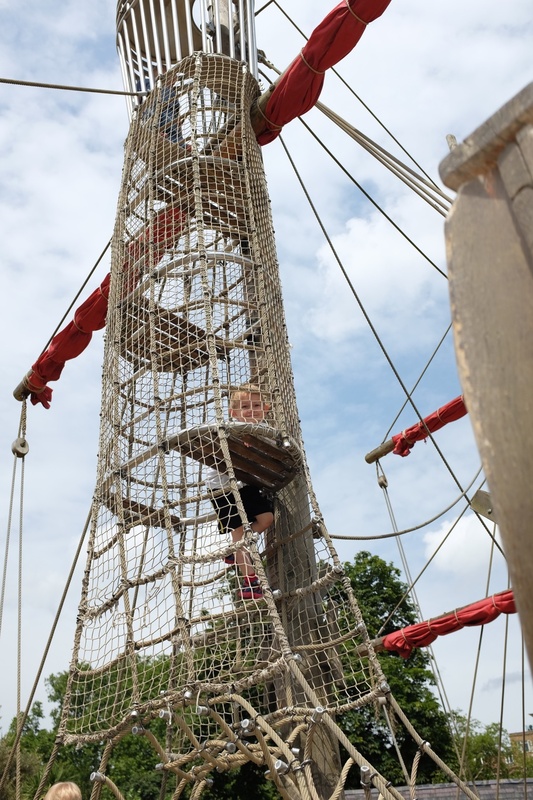 The huge pirate ship is perhaps the most impressive feature, but there are also a number of other areas to keep a kid busy for hours. We have never come across a nicer playground, and it is an absolute must for any trip to London with kids of all ages. Read our blog post to see what more about the Princess Diana Memorial Playground. Also check out our England Page for more about our London travel adventure.